One of my favorite things about cooler temperatures is all things mint (or peppermint). We add that glorious flavoring to hot cocoa, to brownies, to cookies, and most definitely to cakes! 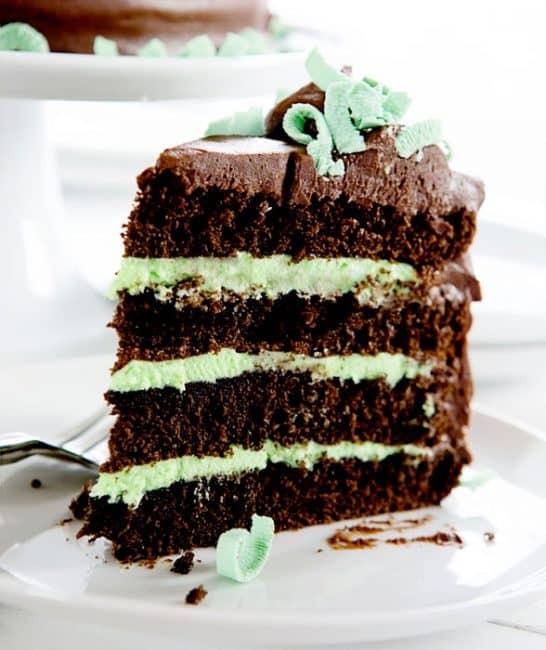 This Mint Chocolate Cake is quite possibly the best one I have ever had! 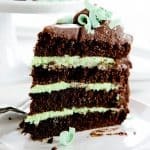 This Mint Chocolate Cake is four amazing layers of dark chocolate cake with a delicate mint buttercream in between each layer. 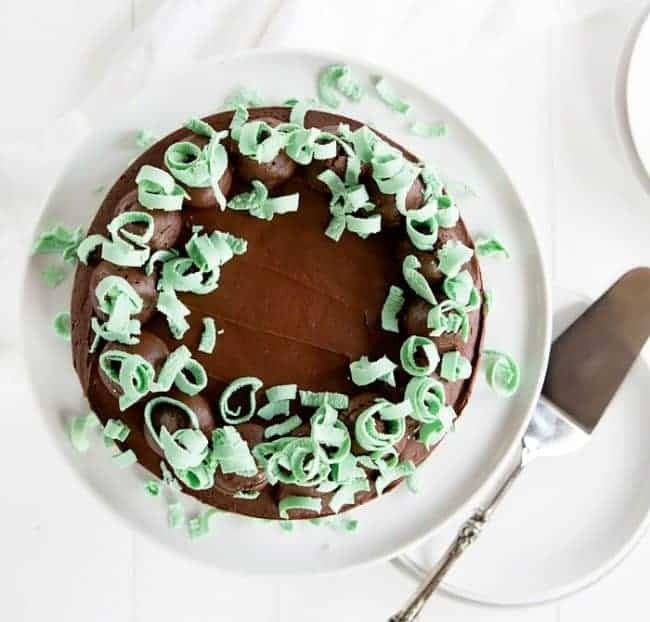 The cake is covered in chocolate buttercream and topped off with a mint green chocolate curl. Minty perfection! Are you baking as much as I am? 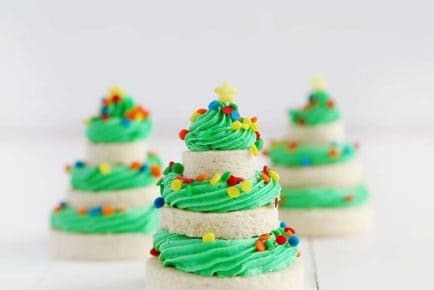 Don’t miss out of these amazing recipes for your get-togethers: Snickerdoodles, Sugar Cookie Recipe, and of course 50 Best Cake Recipes!! 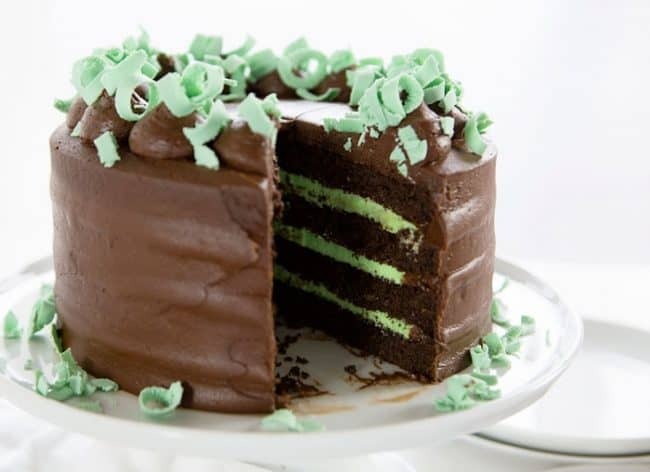 I have to tell you if you are a mint fan, this is the cake for you. 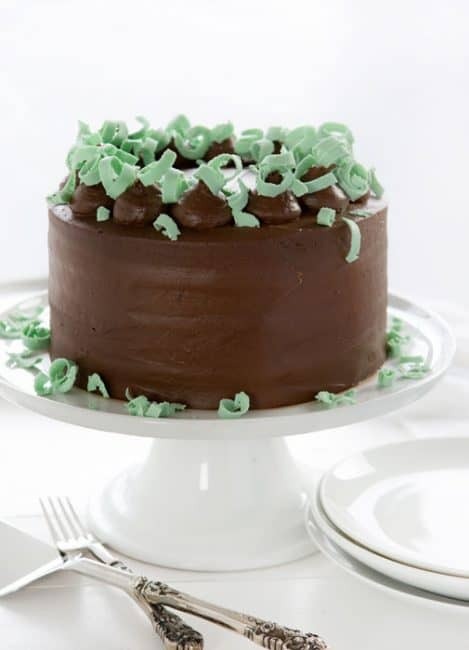 The flavors work together so beautifully… decadent rich chocolate with a subtle minty buttercream. It’s one of the dreamiest cakes I have ever made! Let’s talk a little bit about those curls. It can take a few times to get it right, so I recommend practicing. Or at least buy double what you need so you don’t have to worry about not getting the “perfect” curl every time! I have a post about “How to Make Chocolate Curls” if you want to see a quick video. The Chocolate Buttercream is so glorious it may ruin you for all other frostings! It practically melts in your mouth. 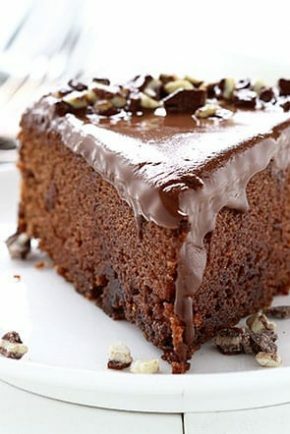 Using a good quality chocolate is important for this recipe! 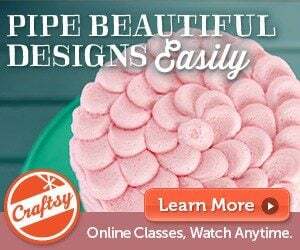 If you have any questions on how to bake a level cake you can go here. 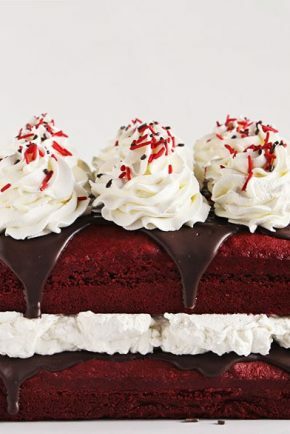 Maybe you want some tips on how to build a layer cake? 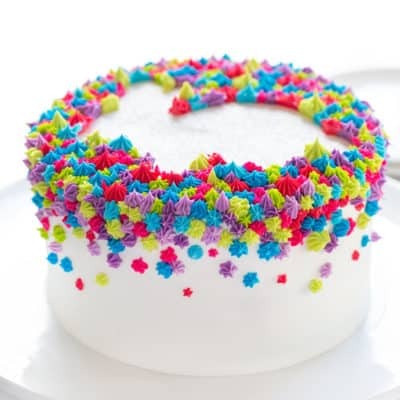 Or frost a cake? Check those links out! 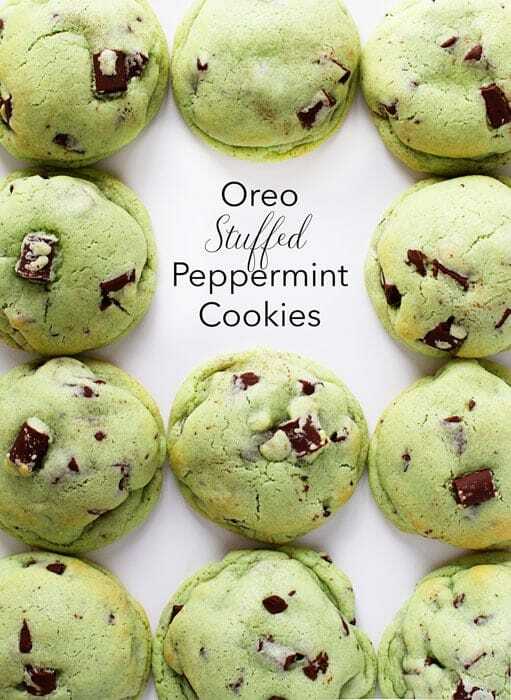 One of my favorite things about cooler temperatures is all things mint (or peppermint). 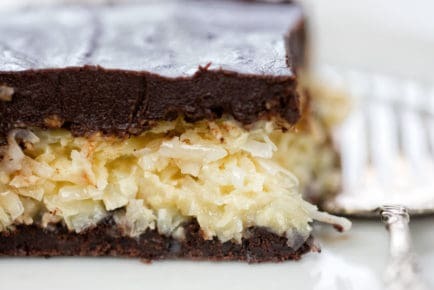 We add that glorious flavoring to hot cocoa, to brownies, to cookies, and most definitely to cakes! Sift the flour, sugar, cocoa, baking soda, baking powder and salt into the bowl of a stand mixer fitted with a paddle attachment and mix on low speed until combined. In another bowl, whisk together the buttermilk, oil, eggs, and vanilla. With the mixer on low speed, slowly add the wet ingredients to the dry. With mixer still on low, add the coffee and stir just to combine, scraping the bottom of the bowl with a rubber spatula. When cakes are completely cool, level each layer of chocolate cake and then cut each layer in half. You should now have four layers of cake. Chill until ready to assemble. Chop the chocolate and place it in a heatproof bowl set over a pan of simmering water. Stir until just melted and set aside until cooled to room temperature. 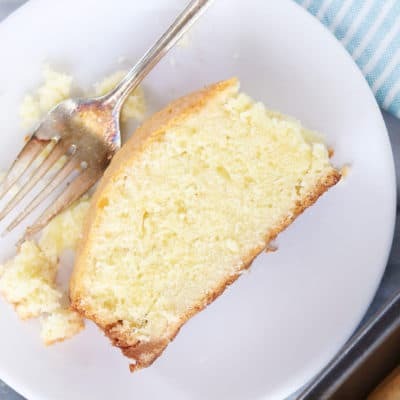 In the bowl of a stand mixer fitted with a paddle attachment, beat the butter on medium-high speed until light yellow and fluffy, about 3 minutes. Add the egg yolk and vanilla and continue beating for 3 minutes. 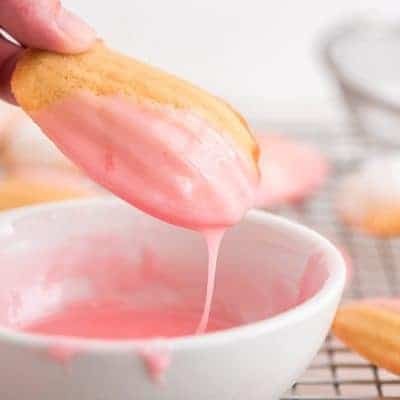 Turn the mixer to low, gradually add the confectioners sugar, then beat at medium speed, scraping down the bowl as necessary, until smooth and creamy. Dissolve the coffee powder in 2 teaspoons of the hottest tap water. On low speed, add the chocolate and coffee to the butter mixture and mix until blended. *Don’t whip! Set aside until ready to assemble cake. In the bowl of stand mixer, cream sugar with 1/2 cup butter. 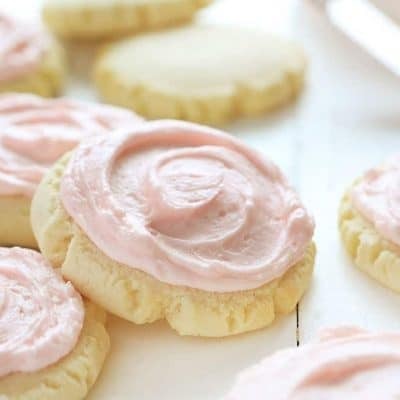 Blend peppermint extract, 2 tablespoons milk, and salt. 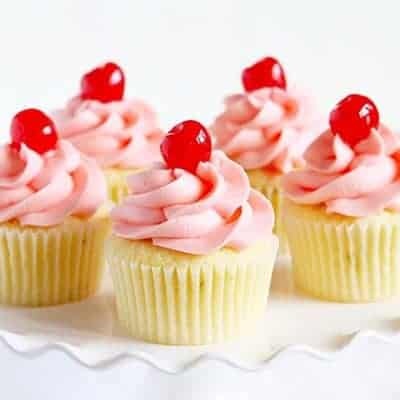 Gradually stir remaining milk into frosting until desired spreading consistency is reached. Melt the candy melts and the shortening in a large microwave-safe bowl for 1-minute increments, then in 15-second increments, stirring after each heating. When candy is melted, add peppermint oil and stir until incorporated. Take out a large, flat and clean cookie sheet and flip it over. We will use the back. Pour half of the melted mixture over the cookie sheet and spread out with an offset spatula. This is important, as you want the layer to be as even and level as possible. Thin is good, but not translucent. Place it into the fridge to set for 1 to 2 minutes. You can also leave it on the counter for about 10 minutes. The mixture needs to be at the perfect temperature for curls to form. If it’s too cold, they will just break. If it’s too warm, they will just be blobs. Press your finger into the mixture. If it leaves a mark, the mixture is too soft. Using a flat head screwdriver (clean! ), press the screwdriver into the mixture at a 45-degree angle and then move forward slowly. Curls should form. 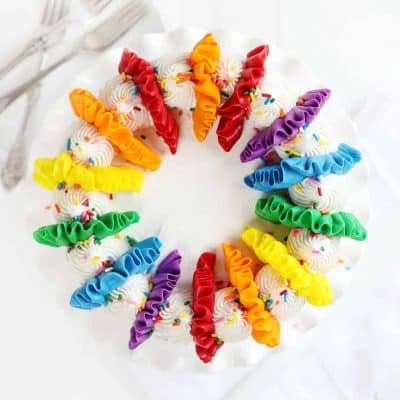 Immediately place curls on a cooled plate or in the refrigerator so that they hold their shape. Chill until ready to assemble cake. Place first layer of chocolate cake on cake stand or cake plate. Spread 1/3 of mint buttercream over cake. Repeat this with remaining chocolate cake and mint buttercream. 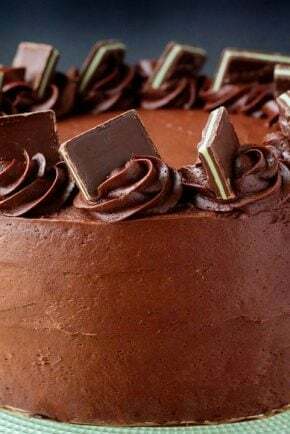 Cover cake with chocolate buttercream. 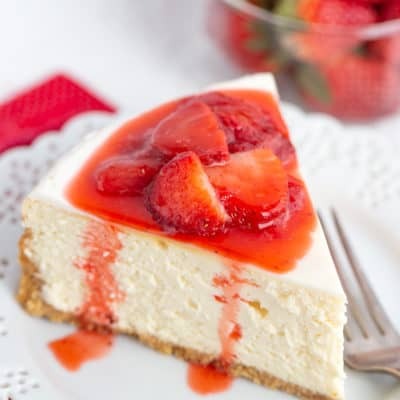 Try to smooth out surface and sides of cake as much as possible. Place remaining chocolate buttercream into a piping bag fitted with a large, open round tip (such as a 2A tip). Pipe out dollops of frosting around the top of the cake. Sprinkle mint curls over top. Chill cake until ready to serve. 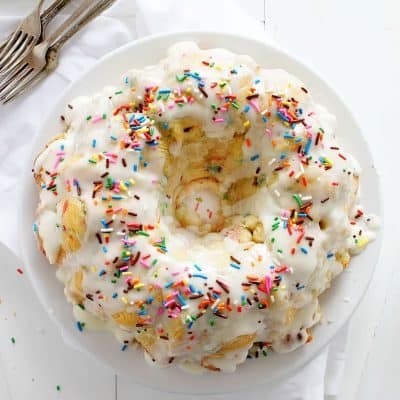 Please confirm your measurements for the icing. A half a cup of butter to 4 cups sugar? I used 2 sticks of butter in the mint Buttercream. I think there’s a mistake in the recipe. HI! I noticed that the chocolate buttercreme in the chocolate mint bake. has a raw egg yolk in it. I am concerned about bacteria. Thoughts? Worst recipe ever. Followed it to a tee and cake all over the bottom of my oven!